Safety training is not only important for employees but also for guests visiting your organization. By utilizing an LMS for your safety training programs you can ensure annual training is taking place, which in turn will prevent costly and tragic injuries. 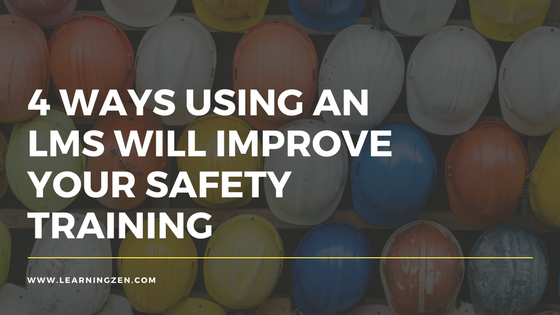 Here are four ways using an LMS can improve your safety training programs. 1. Creating long-term, demonstrable improvement- Using an LMS to distribute information, collect employee feedback and evaluate training gives employers the tool they need to analyze long-term problems and catalogue solutions. By utilizing online quizzes you are able to check if people understood a PDF they read or a PowerPoint presentation they looked at, or if they understood what was covered in an instructor-led, classroom-style training session. This will help create systemic, continuous improvements for safety programs and the organization itself. 2. Compliance tracking- Reporting on who has passed and completed Safety training and who has not can help with liability protection for your company or organization. Also, to be able to set up automatic reminders when Compliance Certifications are about to expire ensures that the employee and the company does not incur costly penalties. 3. Reduce human error- Learning Management Systems streamline operations and reduce human error. Automated information collection, delivery and employee evaluation means more time for safety staff to focus on priorities. Automatic updates ensure that employees receive training renewal on time and make it easy to provide authentication of compliance on the job site. Incorporating the use of Videos can show the employee exactly what is required and how to properly perform a specific procedure without the element of human interpretation when presenting that information. 4. Augment Face to Face & Classroom sessions-The best kind of LMS will also incorporate the face to face training and classroom sessions and to be able to track that information in conjunction with the online portion of your LMS safety training modules. An LMS will never be able to replace the Classroom sessions but will be able to effectively augment the direct instructor contact with a method that is fully trackable, reportable and repeatable with a simple click of a button. This will also help augment the cumbersome paper based components of some of the current standardized federally mandated safety regulatory organizations that are currently in place.